We’ve all been there – you’re taking a road trip or simply driving to work and you want to listen to your favorite tunes from your iPhone. So how do you connect the iPhone to your car stereo? Simple, all you need is a Bluetooth FM transmitter that will allow you to make hands-free calls and wirelessly stream music from your mobile device to your car stereo. The Soundfly View is just that – a compact multimedia solution while you’re on the go. 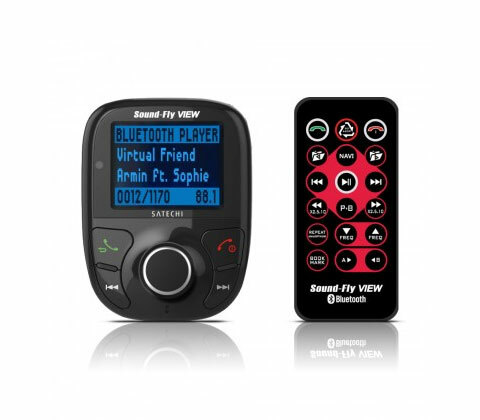 The Soundfly View by Satechi features a 2” LCD screen to display your mobile phone’s information, such as incoming calls, contacts, playlists and FM stations. It can play music through both Fm frequency and directly by connecting a 3.5 mm aux input jack to your iPhone, iPod, Zune or any other MP3 player. It also supports RDS (Radio Data System) functionality, and includes an SD card slot to listen to MP3 files or audio books stored on your memory card. There’s also a USB charging port if you should run out of power, and if you’re more comfortable using a remote control – not to worry, you’re covered.